You're planning to purchase jewellery, ingots or coins - but are they real? The Goldanalytix density scales is the universal solution to this question because a gilded brass ingot differs extremely from the density of pure gold. The density is tested by the tried and tested method by Archimedes. To do so, the object is weighed with a filter under water, then "normally" and then the measurement is already done! These two different values allow you to immediately establish the density using a simple formula for your calculator. The realization of the measurement is very easy and the density's value is fast established. This allows you an insight into the quality and carat number of gold or also first clues for eventual forgings. The density establishment of geometrically very uneven objects are therefore no problem. Besides ingots and coins, you can easily examine cuttlery, candlesticks or picture frames for their specific weight. Just fill the scales' container with water and you can already start. After the realised measurement, you can calculate the density within seconds. The results are precise and accurate – as you'd expect from Goldanalytix. 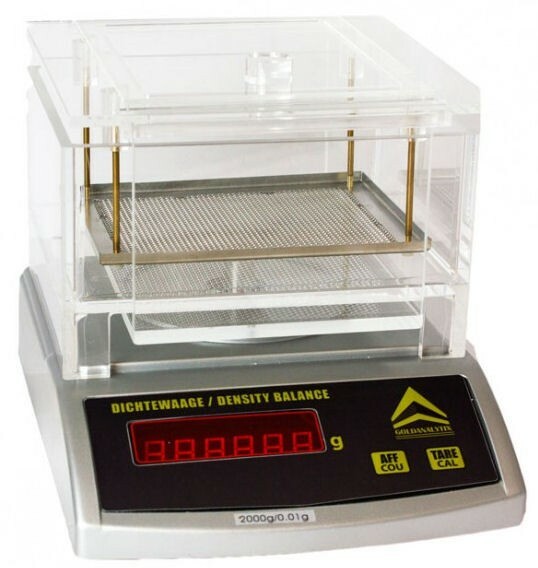 The density scales can also easily be used by unexperienced users. Related links to "Density balance"
Instruction manual for Goldanalytix Density balance as PDF file. Customer evaluation for "Density balance"